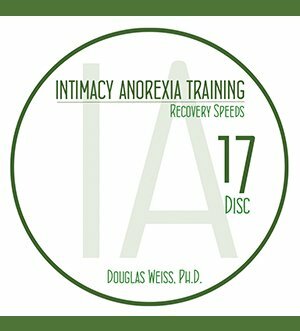 IAT 17 – Recovery Speeds DVD is the 17th DVD from the AASAT Intimacy Anorexia Training Course. It discusses the two recovery speeds of intimacy anorexia. IAT 17 – Recovery Speeds DVD is the 17th DVD from the AASAT Intimacy Anorexia Training Course. It discusses the two recovery speeds of intimacy anorexia. Dr. Weiss talks about these two speeds – fast and slow! The fast speed accepts their intimacy anorexia condition, educates themselves, and embraces their recovery. The slow speed can be a process that includes denial, difficulty with exercises, and resentment.